BARIndustries holds two US patents and one Canadian patent on the SK1000U (now called The Buttress - click for more) . It is America’s leading retrofit universal wall mounted toilet support. The vertical post has an adjustable swivel foot that when properly set, rests slightly off the floor. This allows the spring loaded hinge to swing in towards the toilet as pressure is applied against it from the front with a mop or other cleaning device. The hinge springs the vertical support leg back into its original position ready to handle the next client. 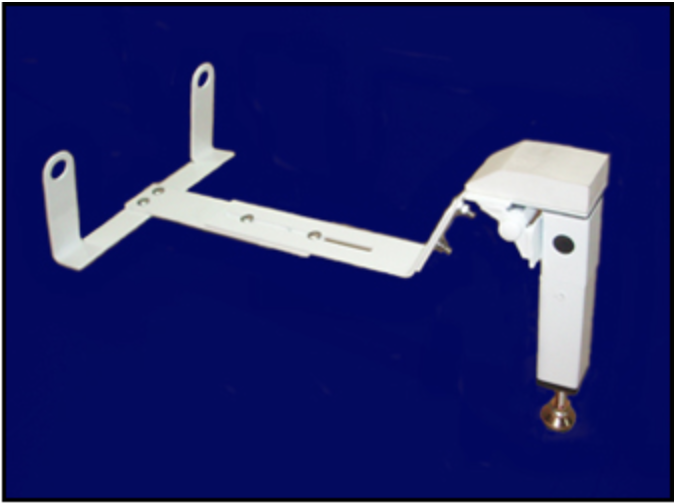 When properly installed, wall mounted toilets are designed to deflect 3/8 of an inch down when sat on which sets the non-skid swivel foot firmly against the floor providing the desired support. Wall mounted toilets can be found in airports, high rise office buildings, rest stops, schools, military bases, hospitals, nursing homes and many other facilities. There are numerous toilet manufacturers and models which are used in the wall mounted toilet industry. Your building may have more than one manufacturer and/or model on the same floor. Each toilet support used to be made to fit a particular model of a particular manufacturer which made ordering confusing. Our universal wall mounted toilet support, SK1000U (now called The Buttress - click for more) , fits 99.9% of all wall mounted toilets on the market. We ship same or next day. We ship same or next day.